Prior to iOS 11, once an app was installed on an iOS device, you either kept it or removed it. 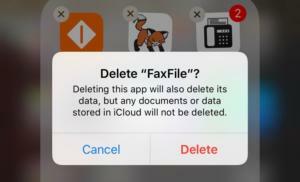 Removing it would cause iOS to prompt you first with a warning that all associated data on your device would also be removed. Some iOS apps get around this by using web-based or app-based accounts or other associations, so if you later reinstall the app, you can relink your data. Several of my apps appeared with “ghost cloud” little icons next to their names on the iPhone screen. Apple Store specialists said those were tied to that old Apple ID, but that wasn’t true. Many NEW apps I recently got or paid for with my current Apple ID had those “ghost clouds” and did NOT show up on my Purchases list in the App Store app. The old Apple ID part, I don’t know what that’s about. Apple should only prompt you for an Apple ID for iCloud. If you use a separate account for purchases from the App Store and other Apple stores, you may be prompted for that password, too. If you have apps or content installed registered to another account, you can also be prompted, but Audrey says that’s not the case and she hasn’t been prompted through years of other updates and phone transfers. Let’s put that to the side, as I don’t have an answer. I can explain what’s going on with the cloud icon, however. 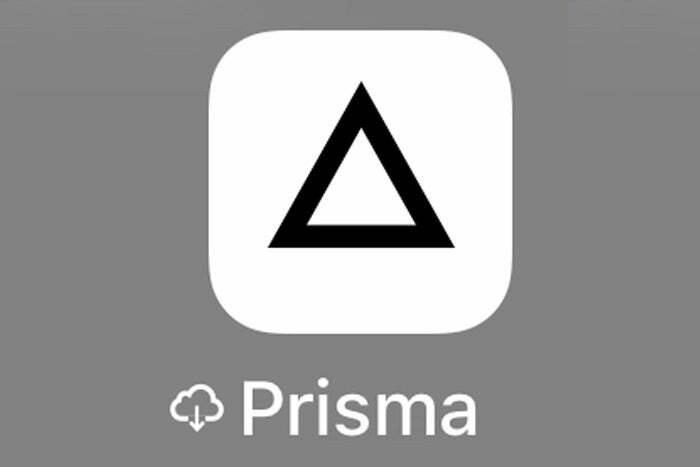 If you see an iCloud download icon to the left of an app’s name, it’s supposed to indicate that you offloaded the app. Offload App is a new option that I can’t find Apple has documented in a support note, and it’s only available if you go to a specific spot in Settings to use it. Deleting an app via the home screen removes it and its associated data and settings. I wondered if Apple wasn’t ready to promote the feature, since I can’t find a mention of it outside of developer documents and forums that are publicly reachable via a Google search. Hold down on any app on any home screen for a couple seconds. (On a device with 3D Touch, don’t pop or peek, just place your finger on the app on the screen without force.). All the app icons and folders jiggle. Tap the X in the upper-left corner of an app. In the dialog that appears, tap Delete to remove it. 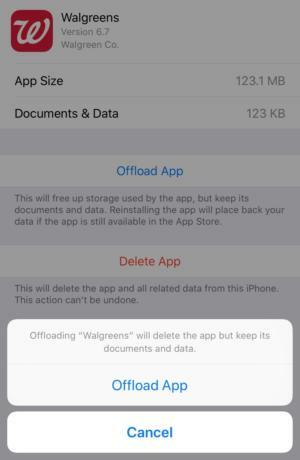 Using iPhone Storage to remove an app gives you an option to offload it and retain settings and documents. Wait for apps to load at the bottom of the screen. Scroll to an app you want to offload and then tap it. Confirm your action by tapping Offload App in the explanatory dialog that appears. I’m baffled both about Apple’s lack of information and Audrey’s experience, but at least I can explain the ghost cloud.